Your on-island contact is Graeme D. Merrin, RB, ABR, GRI During normal business hours, contact (808) 822-0272. For after hours emergency only 808-651-7211. Resort Fees: HANALEI BAY RESORT WILL CHARGE YOU $20 PER DAY FOR RESORT USAGE. THIS INCLUDES POOL TOWELS,AMENITIES AND WIFI. THERE ALSO IS A 6 DOLLARS PER DAY PARKING FEE PER CAR. THE GUEST IS RESPONSIBLE FOR PAYING THESE CHARGES WHICH ARE DUE AT CHECKOUT. Resorts that require “resort fees” for guests staying on the property solely make the decision on what the amount of the fees will be and it is out of the control of the owner of this property. These fees are subject to change at anytime without notice and could change before your arrival and could be different than the original fee stated in your reservation. We make every effort to communicate changes in fees as soon as we are notified. GUESTS ARE RESPONSIBLE FOR FOLLOWING THE HOUSE RULES OF HANALEI BAY RESORT. Violation of the rules can result in fines, and guests are responsible for paying those fines. In severe cases if guests are permanently removed from the condo and from the grounds of HBR by the homeowner, property manager, resort management company or the police the guest will not be refunded for rent paid for unused nights, even if the guest is prohibited from returning to the property. Based on the price we paid we were expecting something suitable but our expectations were so far exceeded upon arrival! The view from the room is breathtaking. I wanted to steal the pillows from the bed they were so comfortable. The restaurant/lounge is great, the pool is beyond beautiful with the worlds best bartender Sam who makes thoughtful and custom drinks and provides great company. The walk down to the Snorkel Beach makes this location beyond ideal. The staff at Hanalei bay is some of the best you will find. We would absolutely stay here again and recommend it to our family and friends. It has the perfect level of Amenities without being an overcrowded resort. Thank you For a great and to our vacation on Kauai! Sudio unit with full bath and kitchen. Sleeps two in the King bed and features a large screen Visio TV with DVD player and fantastic mountain and garden views. I had a wonderful stay at Hanalei Bay Resort # 1205. The condo is in a great location with fantastic views of the bay and mountains in the distance. Happy Talk Lounge is maybe 50 feet away but not close enough to be a distraction. There is a steep trail that leads to the beach. It can be kind of treacherous in places but you can always have the concierge get you a ride. Overall a great, relaxing place to unwind and enjoy the tropical scenery. Our stay at the resort was pleasant, and provided us with a wonderful North Shore location. Exploring the North Shore was convenient, and all the beaches and sights were very close at hand.Resort staff were friendly and extremely helpful, and ready to assist when needed.The unit met our needs well and the view of the water from the lanai added to our enjoyment, and stay. Very nice accommodations the place policed you a bit too much, but just beautiful. Thank you for your review for unit 1205 at the Hanalei Bay Resort. We are glad to hear that you liked the accommodations. We are confused about the policing comment. I know the resort monitors the parking and passes are required to make sure people not staying at the resort do not use the parking lot for access down to the beach so there is enought spaces for the guests. I imagine that the pool hours etc are monitored but other than that I am not sure what would be policed. They also monitor the no smoking rule etc. However all these things would be in place at any resort. We hope you do understand that those things help to accommodate all guests. Small studio with all the amenities one could possibly need for a stay in Princeville. Lovely balcony with a beautiful mountain (and partial ocean!) view, small kitchen with 2 burners and a mini fridge, nice spacious bathroom with a good shower, washer dryer, even beach chairs to borrow! The Hanalei Bay Resort in which it's located has a lovely pool, helpful front desk staff, and a tasty restaurant with a full bar. Beautiful beach just a short walk from your front door – I should note that it requires a going down and back up a fairly steep path, though it did seem like you could arrange a ride in a golf cart for those who couldn't make the trek or had little ones in tow. I would stay in this unit again in a heartbeat! Well stocked apartment!! But needs Renovation and update!! The condo location was amazing. Beautiful views of the mountains and close to the main lobby and pool areas. The condo was also pretty comfortable. Weven were also happy that there was a little kitchenette with stove. We did buy some dried food items, but there was no cupboard space to store them.We did discover that the shower wasn't cleaned well before we arrived. There some were brown smears on the walls, and the drain was clogged from the beginning. Tried to call the main desk, who said they would contact the property management, but no one ever came. We did find draino in the closet by the 3rd day of our stay there and it did work to clear the drain. We thank you for your review about the unit 1205 at the Hanalei Bay Resort. We are happy to hear you loved the location and the condo was comfortable and you made use out of the kitchenette. We did not get any message about the issue you had with the shower. However in all our communication with you through multiple emails and instructions, we told you to call us the property management company directly or our on island contact. We gave you phone numbers and emails for contact information. The front desk at the resort does not manage this unit as it is privately owned, therefore they are not the ones to contact. If you would have contacted us, we would have taken care of that immediately. We hope you can see the importance of instructions. Loved the area and all there is to do. Lots of hiking. Limited on dining options if you want to walk.Condo was very nice with all required amenities.Went up to the St. Regis for breakfast one day which is extremely overpriced. The Regis is dated and sure would not recommend anyone staying there for the money. Condos like this one are phenomenaly better value. Thank you for your feedback and responding to our request for a review. We are glad the condo worked well for you and you enjoyed the island. Thanks for mentioning the value in this condo as it is a very reasonable option with a perfect location. This resort does have the restaurant that is open from 3 to 9pm and there are lots of restaurants in Princeville at the shopping center and a couple others at resorts in Princeville. However it is recommended to have a car on the island because it is rural and not a big city atmosphere where everything is in walking distance. We hope you can return in the near future. We really enjoyed our stay at HBR and in this unit. The views were much better than anticipated, being able to see the waters and beach of Hanalei Bay. The pack'n'play and high chair were very helpful for our stay with our 7 month old daughter, and the spacious bathroom area allowed us to have her sleep in what equated to another room. The three of us enjoyed playing with birds on the lanai during our morning breakfasts. The pool was great, we used the bbq's most nights, and didn't find the walk down to the beach all that terrible. Beach had great views, over the bay and mountains, and one could probably use the St. Regis facilities if desired. All-in-all, really enjoyed our time there. Thank you so much for taking the time to send in your review of the unit 1205 at the Hanalei Bay Resort. We are so glad you enjoyed the unit and that it worked well for you. The resort is a great location and has lots of great amenities. We did want to state that the St Regis does not allow guests from other resorts to use their beach chairs or amenties such as their pool. However you can enjoy their restaurants which have incredible views! This studio is superbly located on the property, near the lobby, bar and pool with a great view of the bay and mountains. It was a joy to wake up each morning and see the beauty of paradise. Room was well appointed and comfortable. I would absolutely stay in this unit again! Our stay at Hanalei Bay Resort was outstanding! The gardens, the friendly staff, resort facilities, easy access to the beach not to mention the views was magnificent. We had two weeks which really allowed us time to relax and explore. Our condo was close to everything and we really felt connected to this beautiful island. The layout of the resort caters for everyone from the beautiful lagoon pool to the tennis courts and the Happy Talk Bar. We loved the live music as well. Thank you for the great review! We are gald you found your experience a great one and met with friendly staff and found the unit to be in a good location. It is a great resort with a great location! The music is a bonus to bring the Hawaiian flare to the experience. We hope you can come again and enjoy! This was my first time in Hawaii and I planned this trip to attend my son's wedding. I decided to make this a long vacation as well and stayed on Kauai for 10 days. The first 5 days were spent in Koloa/Poipu and the remainder of the time was in Princeville. Although the south side was enjoyable, I was looking forward to the north side to see the mountains. This condo sure met all my expectations! For about 8 months, as I arrived to my office each morning, I was greeted with a beautiful photo as my screen saver-the photo of the view from the unit. I couldn't believe the actual view would be that perfect, but it was. I purposely did not shut the drapes at night so that when I awoke in the morning and sat up in bed, THAT was the view I got to see. This unit is perfect for 1-2 people. The mini kitchen was nice as I made my meals for a majority of the time. Having a stackable washer/dryer in the unit was so handy; nothing like packing all clean clothes for the journey home. The bed was comfortable as were the pillows. I enjoyed sitting on the balcony and soaking in the view. There were many different types of colorful birds that would perch on the railing or the trellis and you could hear the roosters below. That sound never bothered me. One day I took one of the beach chairs that came with the unit and headed down to the beach. Just a heads up, the walk down to the beach is very steep (but it's paved) so be careful if you're attempting it in flip flops. Since you have to pay a daily resort fee for parking, WiFi, etc. one included perk is being able to call a bellman to pick you up and take you down to the beach and then back again when you are done (very handy if you're carrying beach chairs, towels, a cooler, etc). It's beautiful at the beach with 2 really large shade trees with the hugest leaves I have ever seen. I plopped my beach chair under the tree and enjoyed the breeze while watching surfers, swimmers, sailboats, the mountain and multi-colored birds walking on the sand. The fancy lounge chairs down there are NOT for the use of Hanalei Bay Resort; they belong to the St. Regis. Unit 1205 is conveniently located near the parking lot, the hotel lobby check-in and the Happy Talk Lounge, on relatively flat ground, Some of the other units are much farther away down pretty steep hills. The pool that is closest is the beautiful resort salt water pool. I had a bellman drive me to the lower pool one day which is a chlorine pool and very private because only one other person was there. This unit is definitely a bargain for the price. The only drawback I saw (not for me, but potentially for someone else) is that there is no dedicated closet. There is an armoire with a place to hang shirts and pants, but not suitable for long dresses. All in all I was very pleased with the unit and the resort. I would definitely book unit 1205 again in the future if I am ever lucky to return to Kauai. I found my eyes started to tear as I exited the parking lot for the airport. The beautiful island of Kauai as well as the Hanalei Bay Resort will forever have a place in my heart. Thank you so much for the wonderful review for the unit 1205 at the Hanalei Bay Resort. We are so glad you enjoyed your stay and the views met your expectations. I do believe the Kauai has got the most beautiful views of anywhere I have been. Pretty Amazing!!! We do hope you can come back again and enjoy and relax! We enjoyed our visit. The condo was very nice and conveniently located. We did have a problem with the toilet but did not let us not enjoy our stay. I will immediately investigate what went wrong with the bathroom fixture and have it fixed, of not done already. Hope you had a wonderful time. Great view of Hanalei Bay and the mountains surrounding same. All listed condo amenities in place and in working order. Pleasant and helpful staff. Wonderful salt water pool. Access to Makai Course from parking lot for early AM jog = major plus. Recommend highly. Thank you for your review and letting know about your stay. There are great views from the Hanalei Bay Resort and lots of great amenities. We are so glad you found the staff to be helpful and pleasant. We hope you can return! We loved this resort! When we pulled into the resort we literally thought we must have made a wrong turn because it was SO beautiful. Amazing price for that view and the location in Princeville is the absolute best. We already booked another vacation to Hanalei Bay Resort for next year! The bed looked right out onto the spectacular view and was very comfortable. If you plan on cooking in the tiny kitchen be aware there is only about 12" x 24" space for drying dishes or meal prep unless you move the microwave but we only cooked 1 meal in the kitchen anyways and we made it work. Thank you for your wonderful review and taking the time to post. It is a really beautiful resort and a perfect location with amazing views from everywhere! This studio unit does only have a kitchenette and not a full kitchen but it does accommodate some cooking and food preparation and storage. Also we would mention that there are BBQ areas on the resort property to also assist in meal preparation. We are glad you made it work and we do hope you can come again! Thank you so much for the 5 rating for the unit 1205 at the Hanalei Bay Resort. This is a great location and the condos does have all one needs in a studio unit and is reasonably priced. We will have someone look into the microwave and see what you might have been talking about. We have not had any complaints about it. If there is an issue it will get replaced. We are you would like to come back to this condos! My husband and I arrived around 7:30 pm, so we couldn't see much of the grounds.We were pleased to find this condo was close to the parking, the pool, and the sports bar lounge, and since we were very tired we closed the doors to the lanai and we're also pleased to see how the sliders cut out all the noise from the bar. Also the bed was so comfortable, my husband gets up in the night and it never moved, so I got a great sleep . In the morning I felt rested.We never had a problem with noise from the adjoining unit even though it was occupied. In the A.M. we woke to an amazing view . We had a great 4 days and would do it again in a second. So glad you had a wonderful stay. This condominium does have an amazing view! Clean room with a great view of the mountains and a sliver of Hanalei bay. The in suite laundry was a lifesaver with our 9 month old, and there were tons of things to use such as coolers, chairs, umbrellas, boogie boards, and a pail and shovel for baby. The kitchenette was great to have, with a decent size mini fridge, though no freezer. The sink was nice and deep, so it was great for bathing baby. The only cons for us were the lack of blackout curtains, since it made baby's naps and sleeping in impossible, and the noise from the live bands at Happy Talk lounge. The music ends early enough though, and as long as the doors are closed it's not too loud, so it was not a huge deal. 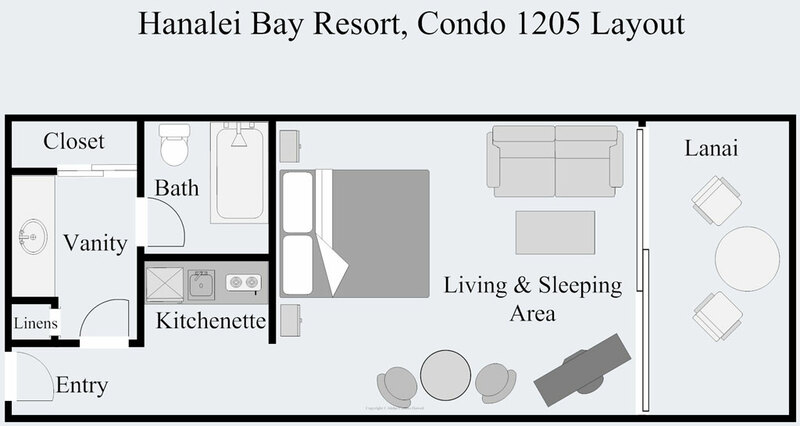 We appreicate you taking the time to post a review for us for the unit 1205 at the Hanalei Bay Resort. Thank you for all the kind words and we are happy you found the unit to be accommodating for your needs. These are individually owned units so what each unit has is specific to the owners. This unit is near the Happy Talk Lounge so you will hear some of the noise but like you said, they are not open to late and with the doors shut and the ac on it is somewhat more filtered. We are glad you enjoyed your stay and hope you can come again in the future. This place was perfect for my husband and I. Was clean and had everything we needed. The best part was the view from our porch. The mountains were breathtaking. Was a perfect location on the resort too. Close to the restaurants and the pool and parking lot. Quick walk down to the beach with beautiful scenery to look at on your walk. You can hear the neighbors a little through the connecting door but didn't really bother us. We would for sure stay there again. This unit was perfect, I have worked previously at the Hanalei Bay Resort for 5 years and know all the units very well. Unit 1205 is one of my favorites, perfectly setup with a mountain view, amazing waterfalls and some great sunsets. You can literally see the mountains from bed and the lanai/porch is even better. The unit has everything you might need while on vacation. And best of all it is in close proximity to parking, the Happy Talk Lounge and the pool. I would recommend #1205 to anyone needing a beautiful and relaxing place to stay. Unit 1205 was a good price, clean, and had a very comfortable bed! A benefit of it having the bed in the main room was that you could see the amazing view of the Kauai mountains while relaxing in bed. It was nice to be able to snorkel and hang out on the beach right down the hill too, and we enjoyed several lunches at the restaurant. The only issue is that both the front door and the door connecting to the other unit are not sound proof at all. Our neighbors had a party one night, and that kept us up half the night. The doors are so light that you can clearly hear conversations your neighbors are having at normal volume, not just loud noises. Overall we would stay here again since it was one of the best deals on the island. Thank you so much for your review. We thank you for noting the good price, the clean unit and the amazing views. The connecting doors are just like a hotel and sometimes sound can come through. However we can suggest to the owner to try to get some doors that might be more sound proof as an upgrade. Please note that after 10pm the resort has quiet hours and therefore if you would have called us or the resort, we could have taken care of the situation for you. We are glad to hear that you will be back again. We hope to see you soon! Mahalo for your review and taking the time to post. We are always glad to hear how happy our guests have been with their stay. This resort is in a great location and on the most beautiful part of the island. We do hope you will return! We had a fabulous stay at the Hana Bay Resort recently. It is absolutely a tropical paradise! We woke up every morning to the sound of birds and a view that was amazing-the mountains,lush vegetation, and ocean right in view. Our nights were quiet with no other noise but the ocean. And the staff were so upbeat and welcoming. We hope to return with our family someday soon. Mahalo for your great review from your stay at the Hanalei Bay Resort. It is an exceptional location with beautiful grounds and with the direct beach access, it is very convenient. We are so glad you enjoyed your stay and you can come back again to paradise soon! wonderful resort loved everything about it. Condo had everything you could ask for even laundry.Such a beautiful setting so peaceful & relaxing with fabulous views. We recently had 2 nights at the Hanalei bay resort in 1205 and enjoyed our stay immensely. The studio had everything we could possibly need. It had a lovely view even though it was in the building farthest away from the ocean. ( there are still ocean glimpses) We liked the location as it was close to where our car was parked. Other units with better views are a long way to the parking lot. The little beach shared with the at Regis was gorgeous and relaxing. 1205 is close to the pool. We loved the pool although there was some work being done there - it didn't effect our enjoyment of the pool however. The resort is quiet, has beautiful gardens and Beautiful views of the Hanalei mountainS and bay, and isn't over the top which we liked. Our only concern was the connection of the wifi. We couldn't get coverage while there. In the end that was a good thing! We would recommend 1205 and Aloha Condos for their service. Definitely will be back. Thank you so much for responding to our request to give a review for the unit 1205 at the Hanalei Bay Resort. It is a wonderful resort and the location is just perfect. Thank you for noting that this condo had everything you needed. The kitchenette is very convenient to have in a studio unit and the pricing is great! The views from the resort of the surrounding mountains, the ocean and the Hanalei Bay and the beach access are a bonus! Living on an island, it is always a challenge when it comes to reception. This condo is an individually owned unit and is not the provider of the wifi option. However, this is a resort amenity and if you did have problems with the connection, we hope you did speak with the resort about this. Had a wonderful stay in this place. I am a vacation rental host myself and was very impressed with the way this apartment is prepared. This place is an amazing value considering Hanalei Bay is the main place to visit and stay in Kauai and most hotels in the area cost upwards of $400+. We really enjoyed having resort services like fresh pool towels and Beach shuttle. The pool and jacuzzi area is a great spot to relax after a day out exploring the island. You can bring your own food and drinks to the pool. My girl loved having a washer and dryer to do laundry when needed. An overall great stay for an amazing value. Thank you so much for your wonderful review. The value is exceptional with the location and all the amenities! A value like this with the kitchenette that allows for some cooking is hard to come by. The 22 acre resort does offer exceptional amenities, like two swimming pools, hot tub, tennis courts, fire pits, fitness room and guest lounge. The grounds are beautifully landscaped and the direct beach access is hard to come by in Princeville. As you mentioned a washer and dryer in a studio unit is also a big plus. We had a wonderful time in condo 1205. We were the second time in Princeville and the first time in the Hanalei Bay Resort. The condo was very clean and the resort is really nice. The pool area and tennis court are awesome. We are looking forward to come back in this condo. Very, very clean. Sheets fresh and crisp! Simple yet more than adequate. Nice view of property from lanai. Easy access to parking lot, Jacuzzi and pool. This was a nice place to stay. There is a beach that can you can walk to or take the courtesy shuttle. Both are great options. Condo 1205 is nice, clean, and has a small kitchenette, microwave, and coffee maker. A great place to stay. The staff is friendly and diligent. The resort has a restaurant that is being renovated so when that is finished, HBR will go to a whole new level. This condo is definitely worth every penny. Located right near a golf course and many upscale homes. This condo is on a resort with an amazing pool area and walking distance to a beach. The only thing I would say is this is not walking distance for anyone with a mobility issue. The hill to get to the beach is pretty steep. If you are physically able, it was an enjoyable walk! The room itself has a island feeling decor which is perfect since you are on the island :). Wicker furniture which is pretty cool! The bed faces a large slider window so you can open the curtains and jus leave the screen door shut to hear and see the amazing sites of nature! The room was equipped with a cooler to take food with you in the car or the beach, bug spray (we didn't need it) all the kitchenware you could need and there is a little grocery store a short drive away. We purchased food there and stored it in the fridge in the room. We spent a week there and thenet family in Honolulu. They kept hearing so many great things from my husband an I about the room that they decided to book the same place the weekend after we checke out of this place! They loved it as well. We plan on returning to this condo next year for a family wedding! I have included some photos from the view from our room out the slider and a few others! This is a very nice condo for 2 people. We had everything we needed, including a very comfortable bed. The grounds are beautiful and it's just a short walk to the beach. We stayed at the HBR for our honeymoon and we could not have asked for a better place. The view from the lanai was so breathtaking and the room was nice and spacious. We enjoyed making breakfast in the morning in the room and eating it on our lanai with the beautiful views. We also liked walking down to the beach and hanging out by the beautiful pool. You cant beat the free Mai-Tais by the pool on Monday evenings! Everyone at the HBR went above and beyond to make our stay enjoyable. Sammi one of the concierges was excellent with helping us set up reservations and everyone we came in contact with said hello and asked how we were. We will definitely be back! My partner and I stayed at the Hanalei Bay Resort after spending 4 days on the Kalalau trail and this small apartment was exactly what we needed to relax! A small kitchen allowed us to cook what we got from the local farmer's market and fish store and the view of the mountains was nice. The place was clean, very well maintained and the bed comfy :-) I'll definitely recommend the place! Hanalei Bay Resort is a top-notch resort with one of the most beautiful views on Kauai.The staff is extremely friendly and always wants to make everyone's stay as pleasant as possible. Both pools are very attractive and the little beach is a ten minute walk away where a family can spend the day safely swimming in the bay or snorkeling. Take advantage of the tennis courts at HBR that have excellent instructors even for people who have not played tennis for years! The 1205 unit in the Hibiscus building has a stunning view from the lanai and is furnished for one's convenience with a small kitchenette, a great flatscreen TV and air-conditioning. The bed is super comfortable too! The condo was comfortable and clean. Our mountain view was fantastic and we greatly enjoyed our lenai. As a rental it would greatly benefit, however, from better lighting in the living room/bedroom area. Also, the kitchen area, although adequate, was "cramped" and not of the quality of the rest of the accommodation. The condo was great until neighbors moved in. What they dont tell you is that there is a door in your room connecting this condo to the neighboring condo and it is a very thin door. You can hear everything your neighbor is doing and saying. I would not stay here again unless I needed both rooms. Owners need to put in a sound proof door. Otherwise the room was nice and had plenty of supplies. The blow dryer was broken and no boogie boards. We’re sorry our guests had problems with noisy neighbors. Our On Island Contact Information is posted in the condo plus it was sent to the guests prior to arrival. A phone call to our On Island Contact would have allowed us to contact the neighbor directly about excess noise and also to replace the broken hair dryer. These are both very easy items for us to rectify and we‘re always concerned about guests’ comfort. All units at Hanalei Bay Resort have these connecting doors as it gives guests several options for renting the amount of space they need. Incidentally the connecting doors are located in the entrance hallway and are in fact double solid core doors set into a 8 inch thick concrete wall. Friendly, welcoming staff and comfortable, clean unit. Location was perfect and grounds stunningly lush and beautiful. Perfect hassle-free get-away spot from start to finish. Only small issue was the constant noise from roosters occupying grounds. We are so glad to have shared Hanalei Bay Resort with you; it is Paradise. In September of 1992, Hurricane Iniki struck Hawaii--the worst hurricane in its history. During this hurricane, almost all of the chickens and roosters kept by islanders in their backyards escaped from their pens and have reproduced extensively. They roam the island in considerable numbers. Many of the islanders and visitors feel that these birds add to the flavor of the island--an enhancement. Others feel that their presence and occasional crowing are a nuisance. Hanalei Bay Resort has a program of intermittently rounding up these birds and redepositing them elsewhere on the island. It is likely that you were at Hanalei Bay Resort just prior to one of the repositioning efforts. This is an issue that faces all of the Hawaiian islands, courtesy of Iniki and we hope that it did not adversely effect you enjoyment of this Paradise. We had a great time at the resort. The Condo was as expected and we would stay there again. This Condo is an incredible bargain. Well-appointed, beautiful views, wonderful new bed, and an incredible resort--with the best resort beach in Kauai. Thanks. Great condo. Great views. Very relaxing. Loved the condo. It was comfortable and well appointed. Great views of the mountains and Hanalei Bay from the lanai. Only wish it had an iron and ironing board -- somehow no matter how well you pack -- after at least 8 hours in a suitcase clothes just don't look the same! Happy that you enjoyed your stay. Ironing board and iron are available at the front desk. Great view from lanai. King size bed and tastefully decorated. We apreciated kitchen so we could enjoy our full american breakfast at the lanai. The perfect start for the day. Very nice with the laundry machine after our trail walk! Close to parking and main pool area. Only thing missing was an iron. The photo does not do justice to the view actually seen from this room which is breathtaking. The room is open and light, very well supplied and having the washer and dryer in the room was an absolute plus. Wonderful condominium--well appointed. Beautifulview. Very Hawaiian. Excellent staff. The swimming pool and beach are to die for. I love this place. Beautiful place but there were lots of missing things that I assumed would be there. No oven, no freezer, no DVD player. The gym was totally inadequate for anything except yoga. I was also disappointed that there was no honeymoon upgrade as is standard with most hotels. Great views, nice pool, short walk to the beach, grocery store down the road with a redbox so on the whole not too bad. Condominium 1205 has been remodeled for the modern, up-to-date couple that wants to have a restful tropical vacation. The kitchen is more than adequate for almost all meals, and it is purposely designed so that this husband doesn't have an excuse not to take his wife out to dinner. It has a washer and dryer, MP3 player, flat screen TV, and other amenities for your enjoyment. The views and short walk to the most beautiful beach complete the picture. P.S. : All the condominiums are privately owned; this is not a hotel, so a honeymoon upgrade is not available. The condo and resort are clean and beautiful. The views are incredible and we enjoyed walking down to the beach. Good value for money. Nice pool and perfect location. The unit offers tile flooring, a king size bed, viewing balcony, kitchenette, nice size updated bathroom and includes a washer/dryer set. It includes fresh towels, soap, shampoo, cleaning products & kitchen amenities. All of this in tropical style decor! Very comfortable. The balcony overlooks greenery. Great condo at our favorite Princeville resort. We spent five fantastic nights at this condo, located at the Hanalei Bay Resort in Princeville. This 2nd floor condo is centrally located to the front desk, parking lot and main swimming pool. The unit was loaded with amenities. From a fully-stocked kitchenette to a large bathroom with no shortage of soaps, shampoos, towels, etc. There is even a stacked washer/dryer unit off of the bathroom (a huge plus). The king bed is very comfortable and the sleeping/living area also boasts a dresser, armoire, sofa, coffee table, 2-person dining table and a wall-mounted, flat-screen tv that pulls out and can be turned for viewing from either the seating area or the bed. The balcony/lanai is a good size, with a table and two chairs. The view of the lush courtyard with the mountains beyond Hanelei Bay is superb. There are plenty of birds and chickens around, and they are a joy to watch. We have stayed at the Hanelei Bay Resort on two other occasions ('04 and '06). This is the best condo we have found, with the best rates as well. Since all of the condos at this resort are now individually owned, you will find a variety of rates for the different units. Aloha Condos clearly has the best rates for their condos. The only downside to our stay is that some of the services at the resort have changed and/or been eliminated in recent years. Both the restaurant and bar are now closed. This is not a reflection on the condo itself, but it is a reality. The two main highlights of this particular resort are still there. These include the fabulous swimming pool. In my experience and opinion, it is the best pool in all of Hawaii. The other gem is Pu'u Poa Beach, located just below the resort. It's the closest thing to a private beach you will find on the island. If your Kauai vacation plans take you to the north shore, don't pass-up the opportunity to stay in condo #1205, Hibiscus at the Hanelei Bay Resort. You won't regret it. Really enjoyed our stay at 1205. Nice and relaxing, comfortable and homie! Wish the restaurant would have been opened, would have been easier to find at least a breakfast close by instead of having to drive everywhere, but...it was a very nice and quiet resort! Overall, it was a good experience. Communication prior to arrival was clear and helpful. Check-in was easy and the unit was as described. The unit was pretty clean. We found no bugs or lizards and no real dirt to speak of. We did need to wash all dishes before using them, they were clearly just rinsed. The small kitchenette was clean and stocked with any dishes, pans and utensils that one might need. The furnishings were fine and the bathroom was nice and spacious. The large flat screen TV was nice as was the view from the balcony- that was the best part. The mountains would take our breath away each time we looked out. I thought more care could have been taken to better clean the balcony. Let me stress, these are minor things. I think this condo is a great value for the money and I would stay here again. The resort is nice and you have access to shared propane gas grills. The pool is beautiful, quiet and clean. The unit was very good. With a few tweaks, it could be great. We were very pleased with our stay in 1205 @ Hanalei Bay Resorts and couldn't be happier with the deal we were able to secure through alohacondos.com and would recommend it to anyone looking for a good value while on the north shore of Kauai. The unit was close to the parking lot and had a great view of the Napali backdrop and resort grounds. We enjoyed the view from our lanai and often found ourselves taking in the morning air or afternoon view, just relaxing there. The washing machine really came in handy after our hike, where we got a bit muddy, so I really appreciated having the option to wash our clothes. The kitchen was useful too as we got some pineapple from the Foodland near the St. Regis. The affordable prices of the condo and the location of the beaches were perfect for my family of 4. We traveled to the north shore of Kauai and with only 2 luxury resorts available, finding the Hanalei Bay Resort condo was awesome. The rooms were comfortable and clean except for the fact that the a/C unit was a bit more finicky than I preferred. If you want to visit the north shore and find a deal, this was the place. We would definitely stay there again if we head to Kauai. We are pleased that you have enjoyed our recently renovated condominium. The air conditioning unit allows the user to program temperature, duration, direction, and start and stop times, or it can just be turned on or off with a chosen temperature. This allows our guests to have a multitude of choices with respect to the temperature of their environment. we did find it abit difficult to locate off the road... there was not good signage... we actually missed it by a couple of miles and had to turn back. the only drawback was the soundproofing.. our condo was attached to the condo next door via adjoining doors.. we could hear very clearly the conversations held ,amongst other things....:) other than that, our stay was delightful..
Mini washer & drier was a nice surprise as was the king size bed. Plenty of dishes, cups & silverware. Nice TV. Good quality towels & linens. Pretty faucets. Very clean & quiet inside. Outdoor stairs are shallow & not bad to manage with luggage. Condo grounds were beautiful as was the pool & its landscaping. This condo is in a good location near parking & not far from front desk or pool. Price for unit was amazing & enabled us to visit Kauai. It would be most helpful to have a place to hang wet bathing suites & cloths on hangers. Even a portable hanging rack would be nice. Bathroom tub area could us more lighting. The sharp corners on the cupboards need sanding down, scrapped my hand on one. Washing machine drain isn't plumbed correctly causing it to back up drained water into the bathroom sink. Could be bad if someone put something in that sink. This unit was so nice & better than we expected for the price we paid. The porch view of the mountain was very pretty. Loved waking up to see it. The staff is most helpful & their Aloha spirit welcoming. We didn't like leaving the place! Thanks for making our stay possible & better than we expected. A nice, affordable place to stay! My husband and I stayed at the Hanalei Bay Resort, condo #1205, in Princeville from March 3 - 6, 2010. We booked our reservation through Kristen at Aloha Condos and were very impressed with her customer service and honest recommendations. The room was exactly as described- newly remodeled, clean, conveniently located, great view from balcony, washer/dryer and a small kitchenette. The only minor issue with the condo was a plumbing mishap that caused the bathroom sink to fill with water when the washer/dryer was in use. We reported the issue to Kristen and was informed the owner would be arranging for a repair at a later date. Hanalei Bay Resort had beautiful grounds and a nice swimming pool/hot tub. The poolside table and chairs seemed a bit run down but we weren't bothered by this since we spent most of our time exploring the nearby beaches. I would highly recommend this condo for anyone wanting a self-service style vacation at a laid back resort (we are in our mid-30's and prefer "do it yourself" vacations). We rarely came in contact with other guests at the resort and heard minimal noise from other parties. For dining in the area, make sure to check out Bubba's Burgers, Kalypso and Postcards Cafe. All in all, a great place to stay! Stayed 6 nites mid sept 09 Room on 2nd floor (steps). Clean room, very small kitchen & refr.with Mcrwv, sink,2 burner stove top, utensils adequate & worked. A/c good, bathroom dated but functioned. Could have used a couple more small face/hand towels since there was no W/D. Carpet smelled a little musty (most do in Hawaii/tropics).Lanai needed to be cleaned -Aloha Condo Mgr cleaned it quickly, needed iron & board & she delivered that as well. W/D room close to the area convenient & reasonable, needed tidying more often. Nice Aloha package with water, coffee, nuts & tote bag. View was beautiful of property front facing Hanalei bay, had glimpse of water, huge rainbow 6AM, pool no slides but nice size & not crowded. Happy talk loung was ok w/ nice view. Front desk courteous not knowledgable of instructing persons who is responsible for what (cleaning/maintenance. Refrigerator needs light bulb, sink needed fixing,cleaning of lanai, iron, etc.Despite how this may sound our stay was very good here and glad it was available. Will stay again. Fish from Dolfin Fish Mkt is excellent! As of January 5th, 2010, Hanalei Bay Resort condos1205 and 1206 have been completely remodeled - with new porcelain tile floors, bamboo cabinents, sinks, bamboo faucets, roman tub and washer/dryer in 1205, furniture and amenities, flat screen cable TVs, and MP3 players,etc. - designed to make your stay at the beautiful Hanalei Bay Resort a wonderful and refreshing Hawaiian experience. The incredible tropical views from and the serene atmosphere of these units is awaiting your enjoyment. We stayed at the Hanalei Bay Resort for our honeymoon in August 2009. The grounds and pool area were fantastic! We especially enjoyed being able to drink alcohol poolside. The room was average. Carpeting was old and worn and the bathroom sink faucet leaked. But the king size bed was very comfortable and we really enjoyed having air conditioning. Overall, we enjoyed our stay and would stay here again.